The Sphinx, a sail/steam corvette, was the French Navy's first steamship. Built at Rochefort by Jean-Baptiste Hubert and launched on 3 August 1829. The side lever engines were built by Fawcett, Preston and Co of Liverpool. The engine design was copied at Indret for other vessels of the Sphinx class. On 25 May 1830, Sphinx sailed with a French squadron for the Invasion of Algiers. Sphinx and Nageur silenced the coastal defences of Sidi Fredj. She then carried the news of the fall of Algiers back to France. In 1833, Sphinx towed the barge Louqsor carrying the obelisk of Luxor from Egypt to France. In 1845 Sphinx ran aground east of Cape Matifou in heavy fog. She became a total loss. The wreck of Sphinx was discovered in 2005 by Max Guérout. As the French Navy's first steamer, Sphinx was the focus of much attention. Models of the ship are on display at the Musée national de la Marine in Paris and at the annex of the Museum in Toulon. 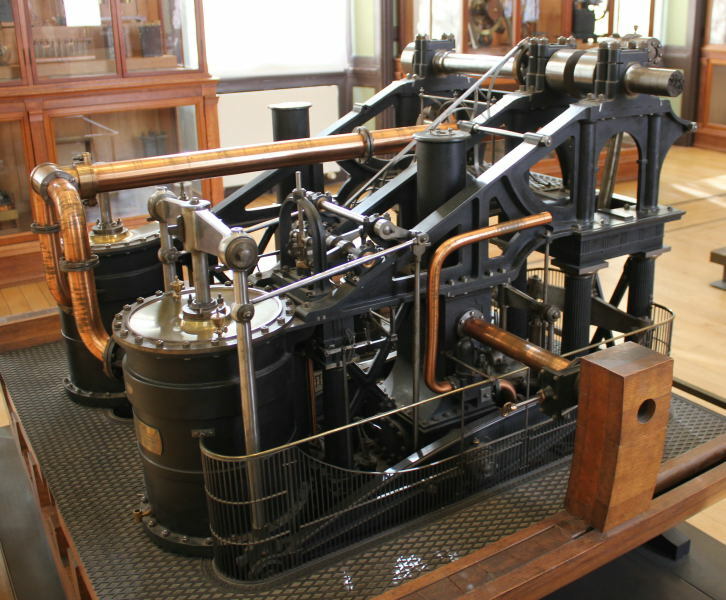 A superb model of her engine can be seen at the Musée des Arts et Métiers in Paris. The model was made by Eugène Philippe in 1843. The above information is condensed from the Wikipedia entry (accessed 14/4/19). This page was last edited on 18 April 2019, at 22:16.